At this point in my life, using pH test strips is the closest thing I’ll get to an adult science fair. It’s strangely gratifying when you successfully match up a test strip to the color guide. Before I get into my experience using these strips, let me start at the beginning. 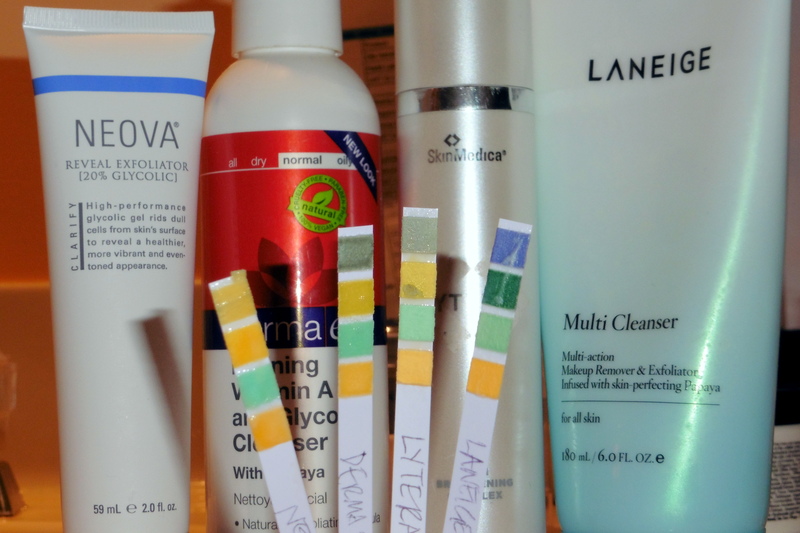 I had heard vaguely here and there about pH in skincare, such as the pH level a product must be at for optimum efficacy. But only recently did I start learning about the natural pH of skin (it’s slightly acidic) and its importance to the skin’s moisture barrier. Skin & Tonics did a great post explaining this concept. Since I have skin on the drier side, I paid attention and basically agonized for a day over whether my skincare was destroying my moisture barrier. Anyway, I decided to stop agonizing, bought these paper pH strips, and began testing away! As a refresher: the pH scale ranges from 0 to 14, with neutral being 7, and anything below 7 being acidic and anything above 7 being basic/alkaline. According to the Skin & Tonics post, the moisture barrier can naturally range from 4 to 6 and a pH on the lower end of that range is healthier. She recommends avoiding products with a pH of 6 or higher (paying special attention to your cleanser) and using an acid at a pH from 3 to 4. The strips seemed accurate. The results were consistent with what I’ve read online or what I would expect the pH to be based on the type of product. Neova Reveal Exfoliator gel: A very acidic 2, which is consistent with the 20% glycolic acid in the ingredients. Derma E Refining Vitamin A and Glycolic Cleanser: An acidic 5, which makes sense because glycolic acid is an ingredient. SkinMedica Lytera: An acidic 5. I wasn’t sure what to expect (it includes niacinamide, vitamin C, and retinol), but since some recommend that retinol products have a pH of 5 to 6 for efficacy (e.g., this post), this was nice to learn. Laneige Multi Cleanser: A very basic 8, which confirms what users on this thread from Asian Beauty Subreddit said. This so explains why it left my skin feeling squeaky clean and stripped dry (see my negative review here). Laneige, why you gotta damage my moisture barrier?! 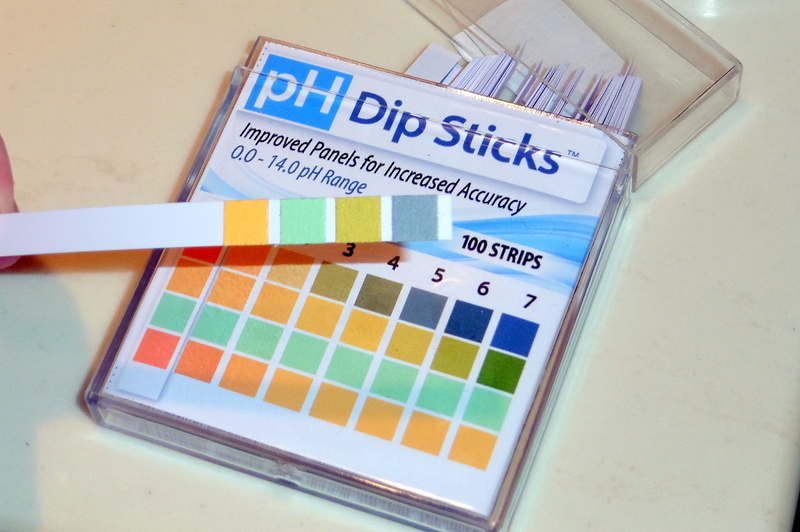 So while you can always try asking a company directly for the pH level, the pH strips are an easy way to check for yourself. I actually whipped these out at Skinfood in Flushing, NY, and tested the pH of several foaming cleansers on the spot. They had pHs of 7 and 8, thankfully saving me from some bad purchases. I did end up buying the Black Sugar Perfect First Serum, which has a pH of (IIRC) 4 to 5. The sales associates were very nice about it (I explained what I was doing) and actually curious to see what the strips would show. Pros: Easy to use and portable. Reliable and quick results. A cheap way for piece of mind ($13 for 100 strips). Haha urine dipstick anyone? But seriously, since S&T’s post, pH has been a big player in skincare to me bc once you get the right cleanser – holy poo, no going back to something that strips your skin. Thanks for the little mini review/guide 🙂 and how rad was it to just test cleansers straight in the store?? Makes me wish I lived in NYC! Learning about pH was such a life changer! And having those strips while shopping actually feels empowering. I’ve busted them out at Whole Foods and Sephora, too.